This vibrant beaded wrap bracelet adds worldly flair to any ensemble. Add a pop of color and worldly flair to your ensemble with this vibrant handmade bracelet. 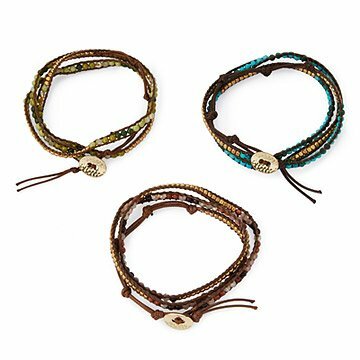 Crafted from water-resistant vegan leather with an adjustable clasp, the beaded bracelet wraps around your wrist three times for a chic layered look. Each piece is hand woven from semi-precious stone, glass, crystal and brass beads in palettes of green, blue, and plum. Khun Aoi designs jewelry and employs 100 women artisans in Northern Thailand, providing sustainable income through her artisans collective. Handmade in Thailand. Khun Aoi is an amazing jewelery designer/maker. She started as a one woman operation and the a quick and loving reception to her exquisite jewelry has allowed her to grow into a medium size business employing over 100 women artisans in Northern Thailand with sustainable income. glass, Jasper, Howlite, Turqoise, Adventurine, crystal and brass beads. Polyblend cord. This bracelet is very pretty, but also very difficult to put on. There is a metal disk that you are supposed to slide through one of three holes in the cord. After trying for 15 minutes I never did manage to get it through. I had to have my husband clasp it for me. This was going to be a gift for my sister, but not now. Very disappointed. At first, I thought I'd get one for myself and one for someone else as a gift. But after wearing the purple one for a few days and being utterly delighted with its subtle beauty, comfort and understated elegance, I decided to go ahead and get the other two colors for myself, too! (Sheepish grin) Although I don't think the 3 colors would really work well together, 2 of them do: the purple and green or the green and blue (which is really more of a turquoise). My only complaint is that the purple one now has a tiny bit of fraying fuzz near the clasp -- not sure how long they are going to last. I wish they were leather rather than an artificial cord, but I'm sure that would drive up the price (and perhaps make them less delicate-looking, as the leather cords would probably need to be thicker). Maybe now that I have all 3, I can make myself buy one for someone else! She wears it everyday, it has a low profile which is great. Doesn't snag sits comfortably on her wrist. My mother loves this bracelet. She said it comfortable to wear all day even while at work. Very neutral colors and go with everything! Liked that it was handmade. A special St Nicholas Day gift for a young lady. She loved it. Everyday use, can dress up or down!